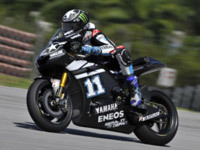 Yamaha Factory riders Jorge Lorenzo and Ben Spies were back in action today for the second official MotoGP test of 2012 at the Sepang circuit in Malaysia. Weather proved to be the biggest challenging factor for the day with rain sweeping in after lunch to wash out much of the afternoon's testing. Lorenzo and Spies made the most of the dry time they had to make a final shakedown on differing YZR-M1 engine specifications to finalize a standard setup for the start of the season. The focus is also on finding a solution to the chattering problem affecting all teams on the track. Ben Spies and Jorge Lorenzo were back in action today for the second of three days of testing at the Sepang International Circuit in Malaysia. The Yamaha Factory riders took advantage of another day of mixed weather to test out the wet settings of the 1000cc YZR-M1 for the first time. A dry morning's riding saw both make big improvements on yesterday's dry times, wrapping up the day in first and second respectively. Spies used today's sessions to focus on setups in the wet and the dry while teammate Lorenzo concentrated on refining the power delivery of his M1 with throttle and engine control. Tomorrow will mark the final day of testing for the MotoGP riders here in Sepang. 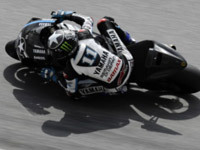 Yamaha Factory riders Jorge Lorenzo and Ben Spies completed the final session of the three day MotoGP test at the Sepang International Circuit in Sepang today. The second outing for the 2012 1000cc YZR-M1 proved to be a great success with the riders getting the opportunity to work through a number of updates including chassis, electronics and setup in both wet and dry conditions. Both riders suffered crashes this morning but were unhurt. Lorenzo spent the final afternoon engaged in a race simulation run, pleased with the results having been able to deliver consistent fast laps over an extended period around the 2'01 second mark. He finishes the second Sepang test in fourth position, 0.404 seconds behind Casey Stoner. Spies leaves Sepang in a confident mood having bonded well with the 1000cc bike in both wet and dry conditions, taking his first ever wet laps of the circuit yesterday afternoon. The Texan wrapped up the test in eighth place, 0.959 seconds from first. "Well, this afternoon was one of the hardest race simulations of my career because the 1000 is more tiring to ride and the rear tyre seems to drop a lot after three or four laps. After this the feeling stays the same but it's very different to last year, it's almost like racing in the rain trying to control the rear in the corner exits and acceleration. I managed to finish the simulation with a good pace so all in all it has been a very positive test, thank you to Yamaha for their hard work." "Today was good, we unfortunately had a small crash but we learnt a lot and got to test some new electronic settings which were a big improvement. We also tried some different shock settings which were a big step forward. It's a shame we crashed but we know from this test that the bike has great potential so we can go to Jerez with confidence." "Despite the rain disrupting the first two days, this has been a really positive test and I am very happy. I did my first laps in the rain on the Yamaha and I had a very positive feeling. The engine was very smooth and I could manage the sliding but one very important area was my physical condition. My shoulder was much better than the first test here and this enabled me to understand the potential of the YZR-M1 machine much more. I am much more confident on the bike and I am happy with the lap time and the position and we have done a very good job understanding many things here. 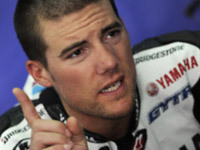 I like the new engine because it helps with the corner entry, and this was already a really strong point of the Yamaha. I did a long run of 15 laps today and it was important to learn the characteristics of the bike over a longer distance. It was really interesting to understand about tyre wear and we have some work to do but the potential of the bike is already at a very high level. Now I am really looking forward to the next test in Jerez because it is a completely different track with different temperature and this will be good experience for me to understand the bike even more." "I am really happy because the weather obviously played a big part the first two days but we were able to get some dry track time today and make some good progress with the bike. I like the new engine from Yamaha and credit to them because they have been working hard and the improvement bodes well for the start of the season. I'm happy with my lap time because this is not my favourite track at all and I am fifth fastest and very close to the top three. A major positive too is that I am very consistent and this is something that I have improved from last year. This gives me a lot of confidence and encouragement and I'm really enjoying riding the 1000cc bike. I did a long run of 12 laps and the new tyres were sliding around quite a bit. It made it very physical but quite good but it looks like tyre management is going to be more important than ever. The bike is working well at Sepang but now I'm curious to see how it performs in Jerez. That's a completely different track and the weather will be much cooler, so this will give us another indication of the potential of the bike."